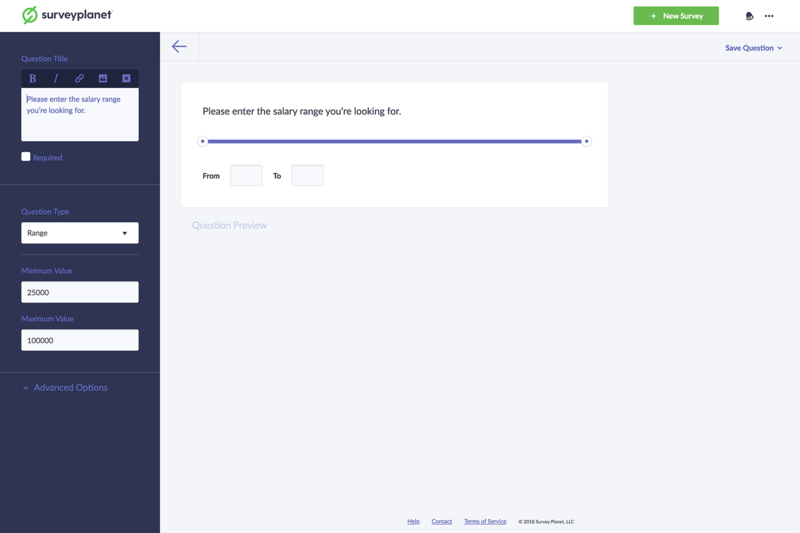 The Question Editor is where you edit your questions for your survey. This allows you to choose the type of question, enter all the question information and make stylistic edits to the questions. To create a new survey question click the Questions icon to go to the Question List page. Click New Question to get started. The question title is where you enter the question you want answered. The font is slightly larger than the answer options will be. As you type, the question title will show up to the right in the Question Preview. If you are a Pro subscriber you can format your question title further by adding bold, italics, links or images. Click the Image icon at the top of the Question Title input field. Select or upload an image from your Light Box. Images can be placed anywhere within your question title based on where your cursor is at the time of selecting the Image icon . You can make any of your questions in your survey required by clicking the Required checkbox beneath the Question Title input field. This means that your survey will not allow people to pass over the question without answering it. If you started a question and want to quit before saving it, click the Back Arrow icon at the top of the page above the question preview.